Today the VIX, known as the 'fear gauge', which measures the frequency and intensity of changes of the SP500, closed near to its multi-year minimum, at $ 9.79, fifth consecutive day below the $ 10.00 level, demonstrating passivity (or permissiveness, or complacency) of the current market, faced with events like yesterday's. What happened was that the repeal of Obamacare (one of Trump's key proposals, which moved Wall Street upwards when they were announced months ago) failed in the US Senate, suggesting that the next big goal of its plan, the tax reform , it can have the same outcome. Even so, the SPX was not aware of the matter, raising 0.54% to $2,473.83, a new all-time high. 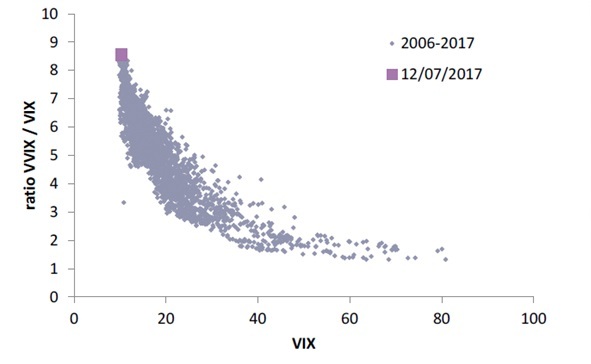 On the other hand, the VVIX index measures the volatility of the VIX volatility index, it is also at a minimum, since both indices travel together. However, if the ratio between the two is plotted, we see that it is at historic highs. That is to say, never a market so calm, so little fearful, as the present. intensitywith which the VIX varies, it is extreme. The concern to a sell-off is evident, the big investors understand this and they begin to look for coverage for their assets, taking advantage of the very low value of the VIX of the market. Natixis Global Asset Management, an excellent reference blog, proposes an interesting trade based on time combinations of SPY puts options and VIX calls. First buy hedge through VIX calls, waiting for the rise in volatility before the sell-off arrives, and at that moment finance the purchase of SPY puts. Later I will detail this strategy.